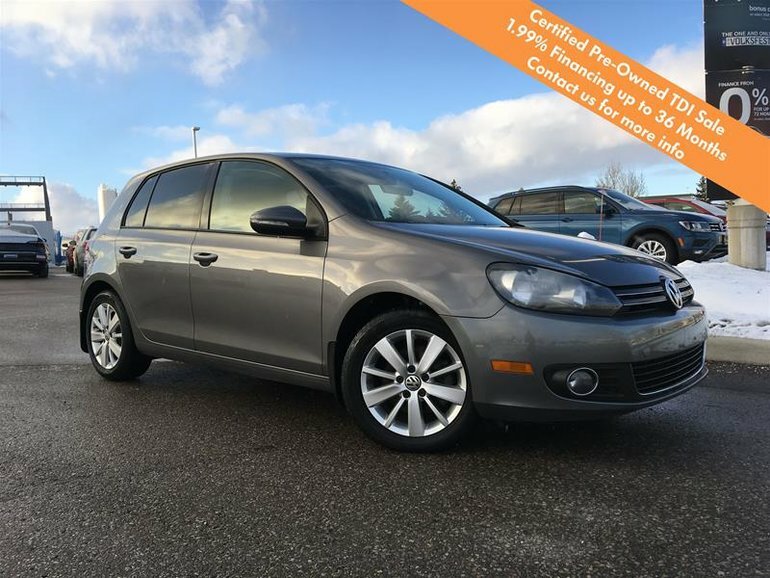 *** TDI Sale *** 1.99% Financing up to 36 months o.a.c | Low Kms| No Accidents| This 2012 VW Golf Comfortline TDI is very well equipped with features including a Factory Bluetooth Radio with USB Inputs, 6 Speed Manual Transmission, Heated Seats, Climate Control, Leather Wrapped Steering Wheel, 16” Alloy Wheels and much more! This VW Golf Comfortline has been fully reconditioned to the highest standards. As part of this reconditioning we have completed a full 112 Point Inspection, Front Brake Pads and Rotors, Rear Brake Service And New Rotors, New Wiper Blades And A Volkswagen Service 1 with Oil Change. With its VW Certified Pre-Owned status this vehicle qualifies for our subsidized 2 year / 40,000kms extended warranty for a small extra cost with huge value. As a Wolfsburg Crest Awarded dealership, we have exceeded very high standards set by Volkswagen. To Volkswagen, Customer satisfaction is held to the highest regard. We are extremely selective in our purchasing and reconditioning process to ensure stress free ownership for you. Much like you, we compare our pricing to ensure every vehicle is priced competitively. Here at Volkswagen Waterloo we aren't about selling you A car, we're about selling you THE vehicle that's right for you. Come see why we're truly Positively Different. Price includes all applicable dealer fees, basic license transfer fee. Just add HST. View our full inventory at www.vwwaterloo.com.